Launceston Geology | Launceston Then! The whole area was formed by volcanic and geological upheaval and has many varying minerals and rocks above and beneath the ‘top layers’; The hill on which Launceston stands is formed of pillow lava, ending just short of the later river Tamar. North and east runs into the Devon Culm Measures. North and west is more sandy cut through for some miles by a heavy clay ground from near Widemouth Bay through Holsworthy. West is mainly lava flows from Laneast, near the river Inney. I believe the area now having the wind turbine farm (Cold Northcott) was a large lake area, later cut by the Inney one side and the Kensey on the other side – the name Kensi, I understand means ‘emptying out’, giving good reason for the said lake area above and the Inney feeders. The volcano was said to be a slowly seeping one forming the outflows mainly to the east of it. 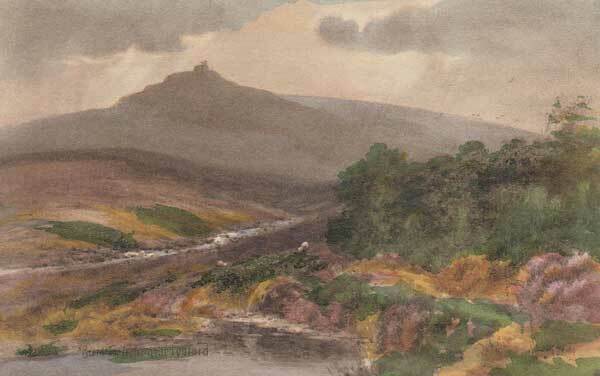 Another volcano is said to have been where BRENTOR Church now stands. The supposed site of the volcano was at on time a stone quarry, later taken by the council for road stone, after removing most of the road stone, the major stone proved too hard for the available manpower and machinery. Another quarrying company inspected the site and found the hard stone was a very good greenstone which could be used for decoration, stone memorials and the like. It was purchased by one of the largest stone quarry owners, but due to the poor roads, which were not wide enough for large vehicles, and which councils refused permission to alter/improve, very little of that stone has been removed. Along the Kensey valley manganese, iron, limestone, lead, silver lead, gold and many other minerals and rock are to be found, though in only minor deposits, so very little records of production are to be found. Some of the ores dug near St Stephens, Launceston, and Egloskerry were carried to Tinney, Lifton, for processing as the amounts singley were not sufficient to make machinery profitable enough on site. Lewannick had slate/stone quarries from early times. Good OCHRE deposits mined into the 1900s. South Petherwin had slate/stone quarries. Landlake LIMESTONE quarry has no land animal remains in it having been formed on sea bed. Mostly Slate/Stone. Bangors firstly poor stone used for road making building – slate found beneath, then poor slate stone for several feet, then very good slate. Bangors quarry is in St Mary Magdalene Parish, the stream around it being the boundary of St Mary’s and South Petherwin. Down stream is to be found the Landlake limestone. Lawhitton also had limestone, with kilns in the early 1800s or before, and brick clay, making bricks was a large business from possibly early 18the century, their bricks being used to build some of Scarne Farm, Town Houses in Launceston and the reservoir under the The Square in Launceston, and probably many more buildings, some time before the Dutson brickworks were erected. The Kiln burner’s office and dwelling at Lawhitton is still a dwelling in 2017, and the brick clay may still be found there nearby. Just across the river, in the Lifton parish, are to be seen several pits from which clay and lime have been removed over many years.